Who? Zoots or Bon Jovi? Zoots. I assume Bon Jovi doesn't yet, as he's in the market to acquire a team of them. Unless Zoots is buying the Bills, I'm not interested. Well it is kind of his name. I don't know if he ever legally changed from Bongiovi to Bon Jovi, but he goes by Jon Bon Jovi, and I imagine thats what his SAG card says. Do you get pissed when people refer to the lead singer of U2 as "Bono" instead of "Paul Hewson"? It's more to do with the fact that they make it seem like the whole band is behind it. Idk, like I said, it was one of those things that's preceded by a" for some reason ". now that might actually be worth its own thread. i probably posted here 4 times before i even really read past "bon jovi" in the title. until the rubber chicken thing, i didn't know it had anything to do with hockey teams. Looks like you had better read it again. i know it's football. Doesn't he own a Canadian football team or an indoor one, the football no one cares about with weird half fields? Used to be part of ownership group of arena football team, not anymore. He's best buds with Bill Belichick, wonder if he'd try and lure him away from the Pats if he bought the Bills. or an indoor one, the football no one cares about with weird half fields? Jon Bon Jovi wants to buy the Buffalo Bills? Great, I want to buy Jon Bon Jovi and burn him at the stake. The death of Buffalo Bills owner Ralph Wilson in March has raised speculation that Jon Bon Jovi will try to buy the team and move them Toronto. However, some longtime Bills fans are trying to clip Bon Jovi’s wings. 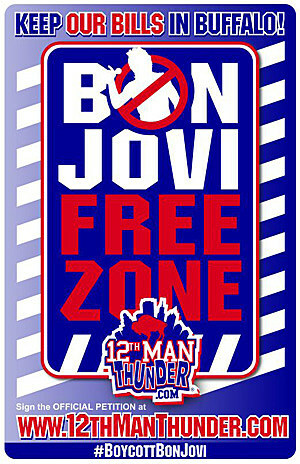 The group, which calls itself 12th Man Thunder, has started a campaign to keep the Bills in Buffalo. In addition to an online petition, they are working to get bars and restaurants throughout the region to stop playing Bon Jovi’s music, and have created a poster to let Bon Jovi know that he is not wanted in their city, neither dead nor alive. Although no official offer has been made, it was confirmed yesterday that Bon Jovi has joined forces with Maple Leaf Sports & Entertainment — owners of the Toronto Maple Leafs, Toronto Raptors and Toronto FC — with the intention of buying the Bills and moving them to the other side of Lake Ontario.